You know I am a firm believer in business led Knowledge Management Strategy. 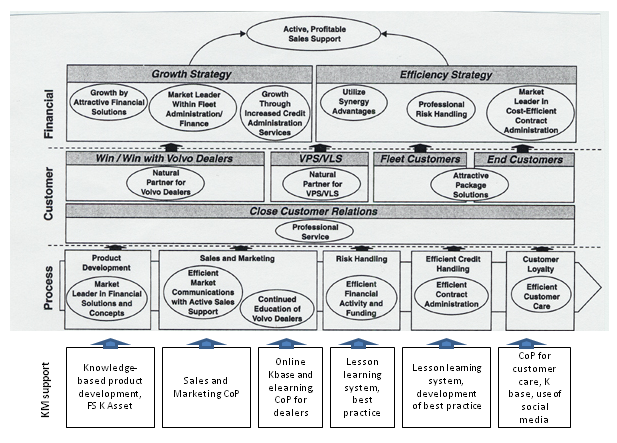 At a meeting yesterday, I saw this presented in a very striking and visual way, through the use of a Strategy Map. 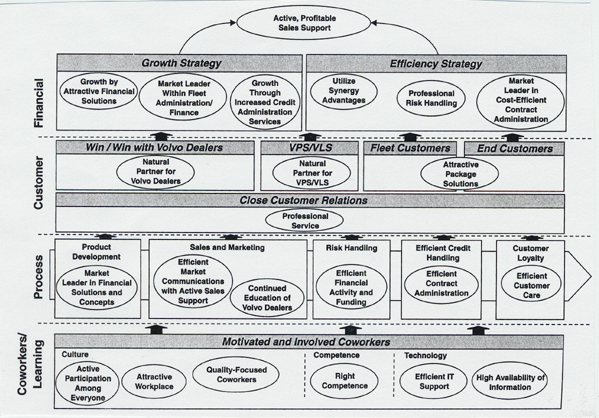 A strategy map is a pretty well established way of mapping out the strategy of a company in a visual way, The approach was invented by Robert S Kaplan, and is well described in this HBR article (from which the example to the right - a strategy map of Volvo Dealership - is taken). A strategy map can be linked to Balanced Scorecard, and can be used to explain why a company is choosing the initiatives that it has. 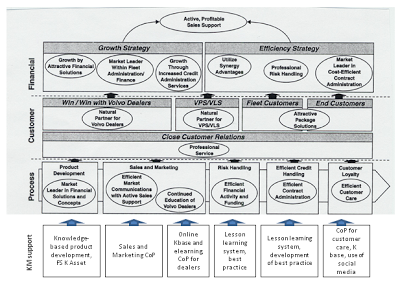 Knowledge Management should be aligned with this strategy map. As we know, Knowledge Management should be driven by the corporate vision and strategy, and should support the key activities that are needed to deliver that strategy. When Kaplan and Norton developed the ideas around strategy maps (later pblished in this book), KM was in its infancy and the "learning" elements were pretty generic (and to be honest, judging from examples, the learning elements are still pretty generic). What KM can do is make these less generic, more specific, and show how the elements of KM can directly support the business strategy. While I would like to take credit for this, and I use this approach, I believe that the author is Robert S. Kaplan.